I am always trying to save my scraps, even if they are metal. I grind my glass, pin backs and bails with my dremel tool (I've found that they stay glued together much better that way), and I started saving all of the grinding scraps. 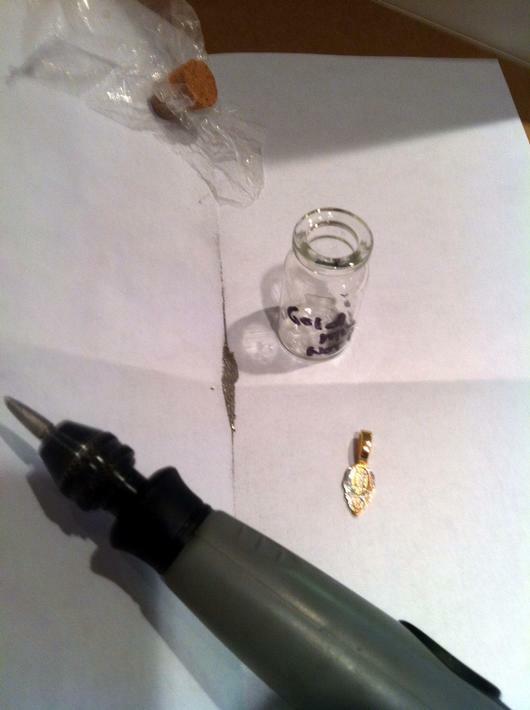 I save the sterling silver grindings in one bottle, and my gold plate with mixed metals, in another. One day, I was looking at some old green sea glass lying on the beach. I thought about folks sending notes out in a bottle, and it being found miles away, full of sand on a beach. I wondered if I could capture that idea in a pendant. When I got home I put those ground metals to use. First, I cut one square of transparent glass, then a smaller square of aqua-green transparent glass, and a tiny square of transparent glass. 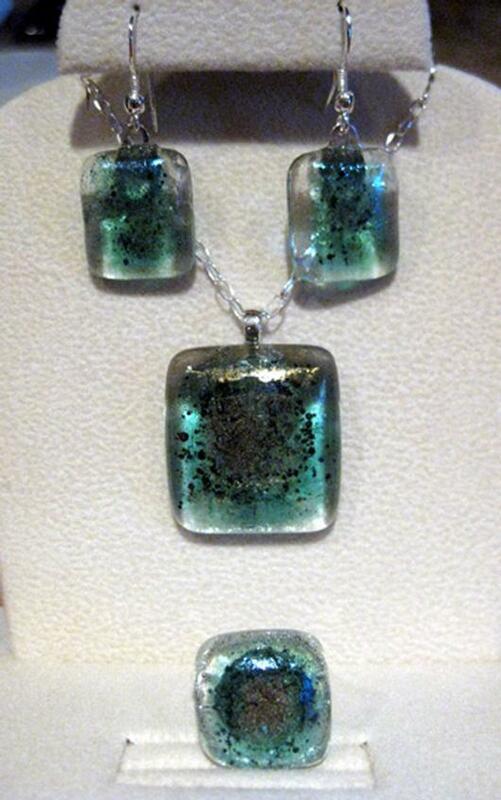 I sprinkled some of the mixed metal grindings on top of the clear glass, then placed the aqua glass on top of that. On top of the aqua glass, I sprinkled the sterling silver grindings, and capped it with the smallest square of clear glass. Once fused, the mixed metals turned a nice dark color like sand, while the sterling silver grindings stayed nice and bright, just like clear sand. The set did remind me of the sand in the bottle, our day walking the beach, and it was a great way to put those precious metal grindings to use. Beautiful, and you have so much fantasy, I would like to have the same knowing, thank you for the sharing with me.